Even with two months of an acrimonious EU Referendum contest still to go, the scaremongering of Stronger IN, the Remain Campaign’s principal vehicle, has already acquired semi-legendary status. Except not, possibly, in the way it anticipated and intended. Because, with its campaign blatantly mirroring closely the EU-phile Cameroon Government’s Project Fear, every instance of Stronger IN disingenuousness, selective interpretation and outright misrepresentation is rightly attracting immediate and widespread challenge and derision, followed almost every time by a swift and effective rebuttal. Today has been no exception: but it’s perhaps worth deconstructing one such instance in detail, to show the extent of the deception which is, increasingly, the Remain campaign’s principal (if not its only) tactic. 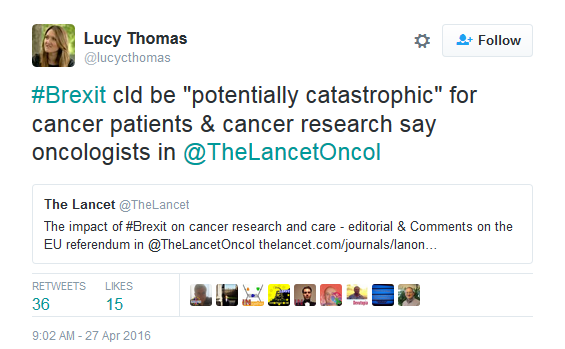 The implication that Thomas’ tweet clearly intends to convey – that the UK’s specifically leaving the EU would adversely affect, “potentially catastrophically”, not only individual cancer patients’ survival chances but even the future of cancer research itself, instantly looks suspicious. Because, as most people with more than a passing interest in UK current affairs know, the UK’s cancer survival rates, compared to those of other advanced countries, aren’t actually particularly good, even while we’re in the EU. 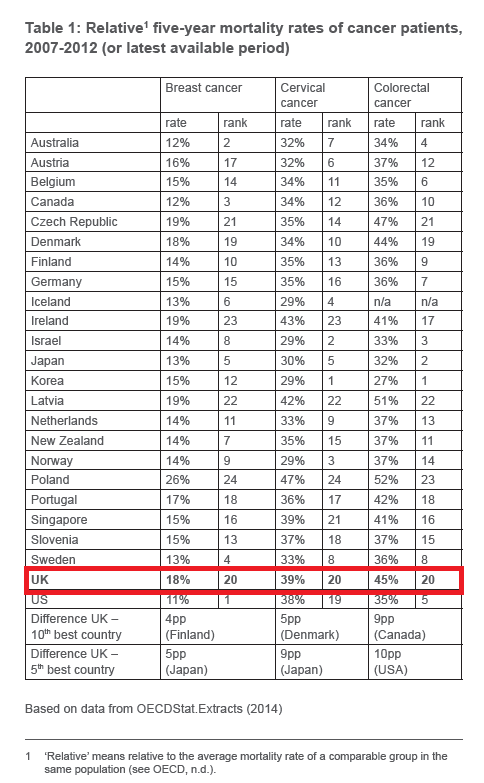 As the chart below shows, in a grouping of 24 countries, we rate pretty badly – 20th overall, in fact. On relative 5-year mortality rates for cancer patients, over the five-year period 2007-2012, not only are we much, much worse than our Anglosphere cousins the USA, Australia, Canada and New Zealand: significantly, we’re also worse than European, but non-EU, Norway and Iceland. At a more detailed, and solely European level, the same outcomes continue. 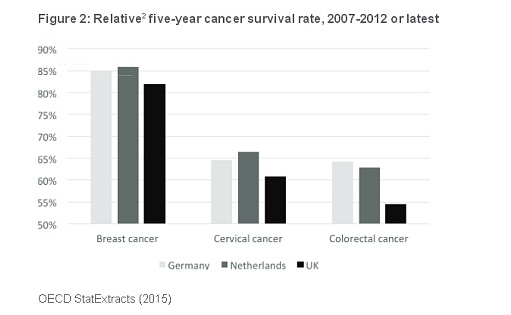 For, as the chart on the right shows, just compared with Germany and The Netherlands, our 5-year survival rates, over the period 2007-2012 for breast, cervical and colorectal cancer were the worst of all three. Norway again. Better cancer survival rates than the UK, and 10 years before. Evidently, not being in the EU isn’t a factor holding back Norway’s progress in tackling the scourge of cancer. 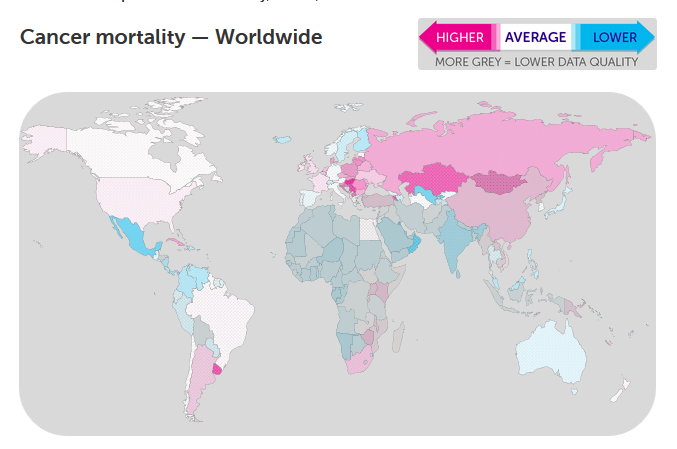 It’s immediately obvious that non-EU Switzerland, non-EU Iceland, and non-EU Norway all have lower cancer mortality rates than the UK. In fact, non-EU Switzerland and non-EU Iceland have lower mortality rates than all the rest of the EU, bar Sweden and Finland. Clearly, cancer survival prospects seem, if anything, to be inversely-correlated with EU membership, rather than the opposite. The empirical data therefore directly contradicts the impression Thomas’ tweet seems to want to convey. 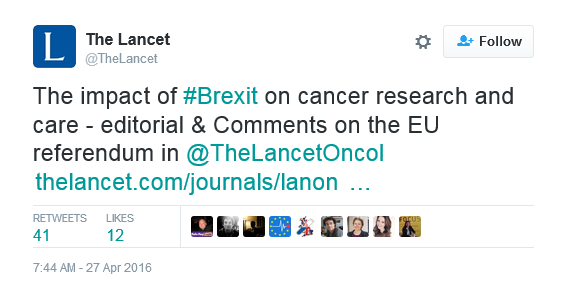 Next, the content of that link in the actual The Lancet tweet, of which Thomas’ is a Retweet-With-Comment, bears closer examination. The article attempts to make two main points. First, it implies that the specific act of withdrawing from membership of the EU political union would be the determinant of worse prognoses and outcomes for UK cancer patients. But, as we’ve seen above, from the better survival rates achieved in non-EU countries, even in Europe, that’s a viewpoint which seems wholly unsupportable. Second, it argues that ceasing to be in the EU’s political structures presages a diminished level of medical-science co-operation. But, apart from offering no convincing argument why this should be so – why do we need to be in political union with, eg Canada, to co-operate mutually on medical science? – the assumption on which The Lancet’s assertion is based itself appears to be at variance with reality. In fact, a mere 7% of policy influence on UK medical science originates from within the EU. 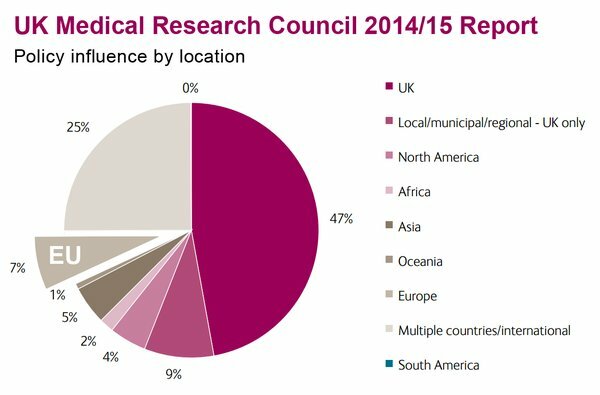 The equivalent UK figure is 56%: and it’s evident, moreover, that the residual 37% far outstrips the EU’s contribution of 7% to UK medical science policy origination. Quite how Brexit would therefore so “potentially catastrophically” affect both UK cancer patient outcomes and UK cancer research is, to say the least, unclear. This micro-checking exercise on just one tweet from the Stronger In campaign probably took no more than 10-15 minutes, including the time spent tweeting the findings as they became apparent. But what it reveals is a reality totally at variance with the impression its Deputy Director is disingenuously trying to impart. Lucy Thomas’ narrative is factually inaccurate, specious and dishonest – a perfect metaphor, perhaps, for an entire Remain campaign that’s Stronger In misrepresentation than it is in anything else.